The oldest operating winery in the region, today visitors are invited to enjoy a tasting of current and back vintage wines in a world-class tasting facility. 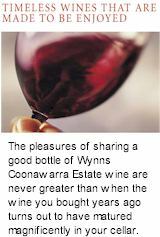 Time spent at Wynns Coonawarra Estate leaves visitors with a powerful and lasting impression of Coonawarra. What is now Wynns Coonawarra Estate was founded by Scottish pioneer John Riddoch. He planted vineyards in 1891 and completed the estate's three-gabled winery. In 1951 Melbourne wine merchants Samuel and David Wynn purchased Riddoch's original vineyards and winery and renamed the property Wynns Coonawarra Estate. The Wynns family recognised the intrinsic qualities of Coonawarra wines - their richness and intensity of fruit character - and set out to build an independent identity in the region. They created the famous label that has made John Riddoch's winery one of Australia's best known buildings. Its wines are regarded as benchmarks for the district, lauded for their consistent quality and depth of flavour. In contrast to its worldwide reputation, the Coonawarra region is a relatively tiny, cigar shaped strip about 15 kilometres long and 2 kilometres at its widest point. Its most famous feature is the terra rossa soil, a rich red topsoil which lies over soft porous limestone with a constant water table beneath it. As the vines have to struggle and stress in extending the roots through the thin layer of terra rossa and the limestone to the water table, growth of the vine is limited to producing low yielding, intensely flavoured grapes. Of all the Australian winemaking regions, Coonawarra - which is an Aboriginal word meaning 'honeysuckle' - stands alone in a number of aspects. The terra rossa soil of Coonawarra is Australia's most famous soil. In reality there are three main soil types within Coonawarra: terra rossa (red or red-brown soil), which always overlies limestone, is on the highest ground and shows no distinct layers; rich black clay rendzina soils over limestone which are located to the west of the terra rossa strip, and sandy, podsolic and solodic soils over clay to the east. Like many great wine regions of the world, Coonawarra's climate is cool and marginal. This cool climate ensures a long ripening period that slowly builds up the intensity of flavours in the grape. The resulting wines will always be among Australia's greatest wines for their richness, intensity, depth of flavour and excellent longevity. Wynns Coonawarra Estate is the Coonawarra's pre-eminent wine producer, with the largest holding of the region's best and oldest vineyards. The terra rossa soil and cool climate produce low yields of intensely flavoured grapes, and the resulting wines have long been regarded as some of Australia's greatest, known for their richness and longevity. Wynns Coonawarra Estate, under Sue Hodder who has been Chief Winemaker since 1998, produces five wines every year. In vintages where the quality of grapes is exceptional, two flagship reds are made, the John Riddoch Cabernet Sauvignon, and the Michael Shiraz.